This post probably has more relevance for my cancer friends and family, the rest of you might not quite understand what I’m going on about, but please bear with me. Here is an insight into the world of regular scans. You might have heard (well… read…) me say before, I don’t get #scanxiety. I don’t see the point in assuming something is bad before I know it is, that just sounds stressful (yes sometimes I’m too logical for my own good but in this instance it’s useful). In fact I think scans are great. They either prove things are fine (yay! ), or they catch anything that isn’t (phew!) then you can start doing whatever is needed to manage/reverse what the scan shows. So I suppose instead of #scanxiety I get #scancitement (slightly less catchy). The results either make me happy that things are good or relieved that whatever is not good has been caught. I guess you could favour being blissfully unaware of things being bad but that’s not great and especially when it comes to cancer, which can lead to things getting a lot worse very quickly. It’s not that I’m happy-go-lucky, ignoring the possibility that the results could be bad, I do prepare myself mentally that the results may not be good, but that’s as far as I go. I’m not minimising other people’s fears when it comes to scans (and a lot of people get a lot worse results than I have so I’m only commenting on my own set of circumstances), I totally get that it’s not something that people can just switch off, I’m just saying that these fears don’t apply to me. So I don’t tend to think things are bad until I find out they actually are, which is generally a good thing, but can also have some not so great side effects when it comes to early detection for if my cancer comes back. I’ve had chronic widespread pain for years and I just put up with it (doctors are yet to find what causes it, I suspect it’s fibromyalgia, or something equally as useless to diagnose and treat). My cancer didn’t present with pain but that’s not to say it won’t if it comes back. I’ve had quite a sore back for the past week, no I don’t think it’s cancer in my spine, but will there be a point where it actually is, and I ignore it for too long and just chalk it up to some other unexplained and inconsequential pain? If I were to go to the doctor about every unexplained pain, I would be there weekly and they would never take me seriously. I also tend to have IBS symptoms fairly often. How will I know if it’s just normal or if I have bowel cancer? My Nan had bowel cancer… (I have learnt from my amazing bowlie friends to look for blood/changes so I’ll keep that in mind). It’s really hard to find a balance between getting everything checked and getting nothing checked. Where do you draw the line? So I am grateful for scans. They take the pressure off me. Although the ones I have won’t pick up other cancers, they are at least checking the most common places for mine to spread to, so that is a relief. If I could, I would opt for getting everything scanned regularly, including blood tests to check for things, and whatever else. That way it wouldn’t be up to me at all and I can forget about it, knowing it’s not my responsibility!! Now that would be a relief!! So I met with the surgeon today. We’re aiming for surgery on the 5th of March. That’s soon. When will I find out if that’s going ahead? Hopefully Tuesday. 5 days before I would be going to hospital. Plenty of time for my parents to book tickets to come over, right? Found out I’ll be losing some of my right nostril in the surgery. He said he’ll try to keep it minimal. So that’s wonderful… Permanent damage. Hopefully only a small bit (still not good), but it’s possible I’ll wake up with a huge chunk of my nose gone. And that’s not like… Fixable. Also losing some of my nose on the inside, all the way up to my eye socket. He’ll build that back though. Found out I’ll need a feeding tube for quite a while. Weeks? Months? And I’ll probably need a tracheostomy during surgery. 70% likely. No talking for 3-5 days post surgery. I’m sure that will be bliss for everyone around me at least! Also it’s likely that the bone for surgery will come from my shoulder. Which I think is better than leg. Oh yeah and if you were wondering, it wasn’t my choice to make whether it’s bone or prosthetic. Prosthetic is only if you can’t bone for some reason. Here I was going into this meeting thinking there couldn’t be much more for them to drop on me. Ha. My mistake. I did also find out that while a year to wait for teeth is standard, it’s possible to start looking at it after 6 months depending on recovery. So there’s some hope. A thousand thanks to my girl Shiri for coming with me to the appointments today. And for bringing me a sandwich! Oh the notes we wrote. Well mainly her. Because I can’t write, remember? So… I’ve had a very big day. I hardly even know how to start. So they’ve been taking blood cultures to see if any bacteria grow, and it turns out in one of the cultures they grew something. They think there’s an infection in my PICC Line, which they told me yesterday they can just give me the antibiotics, and it’ll clear it all up no worries. They said they would take some more blood cultures later today but I guess they forgot to. Today, two doctors came in, brazenly telling me that there was an infection in my PICC line and they’ll just take it out and for now they’re going to put a cannula in me which I have to have the rest of my antibiotics through. Wait, what? You’re doing… what? Ugh. Obviously I said no, you’re not taking my PICC line out, especially not without talking to my doctors first. So what ensued was an hour of them attempting to get a cannula in my arm. They tried in three spots before they finally succeeded in the fourth, right up near my right armpit. I finally got to see an ultrasound machine which they use for finding veins, which was cool, but it did little than to tell them that my veins are almost non existent. Doctor Rainer was good, he tried to distract me from the pain, which didn’t work but I appreciated the effort. I could have sworn he was South African but it turns out he’s Dutch! He didn’t sound like any of my Dutch clients! He was nice though, I liked him. Anyway, after much screaming and shouting and tears from me, I had a cannula in my arm. It hurt. And after a while I couldn’t even straighten my arm anymore. Anyway, they started putting antibiotics through it. I have never been in so much pain, it felt like someone was splitting my arm apart from the inside with a burning hot poker. And the pain intensified as time went on. I got through about two or three minutes before my pain and screams of agony were too much that the nurse stopped it. After about 10 minutes the pain started to subside. They switched the antibiotics back to my PICC line and left me for a few hours. A lovely microbiology doctor came in, Valentina I believe, and said they’ve tested the bacteria they found and for some reason I don’t quite understand, they decided it’s perfectly fine to keep giving the antibiotics through the PICC line, no worries. THANK GOODNESS! So we’re all good again. She also said they’re not entirely sure it actually is in the PICC line. So all of that stuff with the doctor rushing in saying they were taking the PICC line out… completely unnecessary. INSERT SIDE STORY. They took some samples of my blood, and my haemoglobin came back as dropping from 79 to 30 overnight, which is super crazy. So they were talking about prescribing transfusions and all sorts. But it turns out they just got it wrong somehow, and when they did the bloods again my haemoglobin was fine. Um… ok… what they did find though was that my platelets were low. I believe them on this one, I already knew this, as my chemo drug knocks them out. That can be to thank for my never ending nosebleeds at the moment! So they prescribe me platelets. In this time, Ma, Da and Charlie all turn up, and we have a few hands of Uno. That’s fun, and an awesome distraction. Then my amazing nurse Maeve (shoutout girl, I love you, best nurse ever) came in with another nurse and a bag of platelets. They connected them up to my PICC line and they started dripping through but very slowly. Things drip slowly through my PICC line, that’s fine. But the other nurse (we will call her PN, short for pushy nurse because she was not very nice) was not happy. Apparently the whole bag MUST go in within half an hour. I said they could try in my cannula but I can’t imagine it will be any better than the last time. I was hopeful it was just the antibiotics that was hurting so much and the platelets would be fine. So PN pushed a flush through with no delicacy, which hurt a lot, and then hooked it up the platelets and walked out. Good riddance. Maeve set them to drip through really slowly and said she would keep an eye on me to see how it went. It started ok, no pain, but within maybe 30 seconds the pain was building up. I think I withstood it for a couple of minutes before it was unbearable and I was once again screaming in agony. She stopped it, and after about 10 minutes, I stopped crying in pain. It turns out getting it in within half an hour wasn’t as important now. In fact it wasn’t necessary at all. It still hurt, but it was less, so she started again, this time she let it drip through quite quickly. I understood her idea, it’s going to hurt anyway, let’s just try and get as much in as possible while we still can. Once again the agony returned and I was screaming and clenching my fists. My poor audience had to sit through all of my fits of agony. It can’t have been nice to watch. Eventually she decided it was too much and stopped it again. Once again, it hurt more afterwards for about 5 minutes, and then started to get a bit better. They gave me codeine and paracetamol, but it hadn’t started kicking in yet. Rainer popped back in and the nurse explained to him that microbiology said it’s fine to use my PICC line, so he said remove the cannula. I asked how on earth I was going to get the platelets then? He said ‘oh we’ll just get a pump to push it in’. 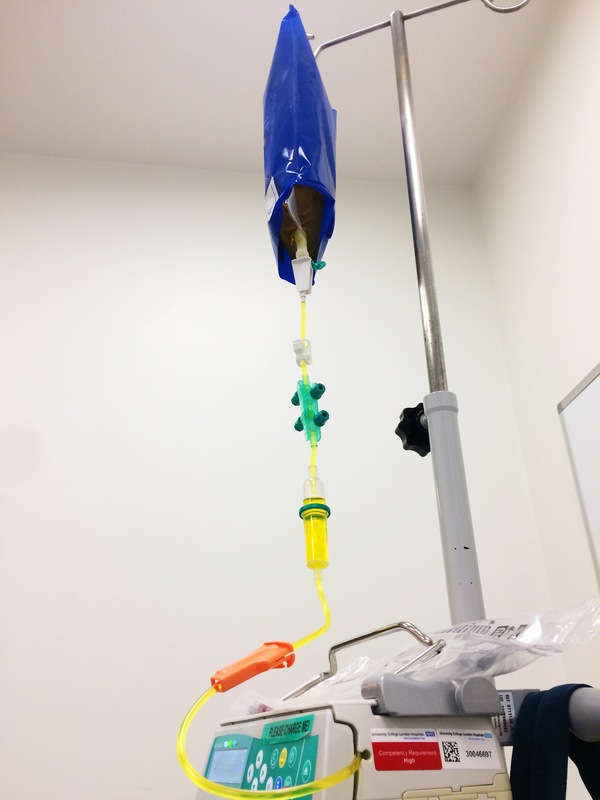 We didn’t need to do any of that platelets-through-the-cannula thing after all?????? It’s been a big day. I’m currently waiting for the second bag of platelets to finish going – I need to keep pumping up the pressure every now and then. And then I can finally catch some sleep. My right arm is swollen and very sore, as well as incredibly bruised in all the places they attempted. I also can’t straighten it – I think they’ve done something to my muscle. At least the cannula is out now. I think I’ll sleep well tonight. At least I’d better! Something I haven’t written about here yet is how it came to my attention that there was something wrong with me. I know I’ve spoken about a dental specialist breaking the news of the big C-A-N-C-E-R word to me, and I obviously have a big lump on my face. But it had to start somewhere. And everything has a story behind it. If you are squeamish about teeth… well… I don’t think this story is too bad, but perhaps proceed with caution. I noticed pretty suddenly (i.e. within a couple of days) that quite a large lump had appeared in my upper front jaw, just below my nose. I figured going to the dentist was the way to go, so I booked an appointment. The first thing he did was to tell me it was an abscess and ask me when I last had a root canal in that tooth. I looked at him puzzled and told him I have never had a root canal. He didn’t believe me, and told me so. Now I love my teeth. I take very good care of them. I think teeth are so important to the way you look, feel, act… My teeth are precious. No I have not had a root canal, thank you very much! I’ve always taken good care of my teeth! I couldn’t think of anything worse than having bad teeth!! Still not believing me, he ordered an X-ray to prove to me that I was wrong. How on earth he thought you could forget a root canal is beyond me. Sure enough, the X-ray came back and showed that the tooth had never had a root canal. He then proceeded to ask me when I knocked the tooth – when I fell over, or hit it, or was playing a ball sport and it got damaged. Once again I told him there has been no impact, my tooth is fine, there’s just something going on in my gum. He instructed me that my tooth was in fact dead, and then he proceeded to push the chair back and tell me that he would take the nerve of the tooth out now, and I would have to have root canal later, done by a specialist. I was in shock. I didn’t think my tooth was dead, how would my tooth be dead? I tried to protest, I said maybe I could get a second opinion first from this root canal specialist. But I was already leant back in the chair, his hands were in my mouth and the injection was done. No second opinion for me. So I lay in the chair, tears streaming down my face, while the dental nurse held my hand. It was painful. And I knew I didn’t have an abscess or need a root canal. But then again, who am I to say these sorts of things? He was a dentist, I was just having a little panic attack because of the shock of it all. He would know. He finished up hollowing out my tooth and taking out the nerve, and tried to cut into my ‘abscess’ to drain it, but with no success. So he prescribed me some antibiotics and referred me and my poor tooth to the root canal specialist. I left in a lot of pain and shock, and £50 poorer. Yes, I got to pay for that lovely treatment. Two days later we went along to the root canal specialist who looked at the tooth and said ‘oh yes it’s dead.’ (Well of course it’s dead, idiot, your mate removed the nerve from it). He said there was nothing he could do until the swelling went down, so he cut into the ‘abscess’ deeper to try and drain it but once again to no avail. He gave me a temporary filling and said to go home, finish my antibiotics and go back in a couple of days. Another £50 for that privilege. I went back a few days later and the first dentist saw me. He was surprised that the swelling hadn’t gone down at all, and decided to refer me to the specialist at Guy’s hospital, just in case. About the only useful thing they managed to do. I left with another script for antibiotics, and the instructions to go home and wait for my ‘urgent referral letter’ to reach me in the post. The other thing the root canal specialist said was that as soon as it got any bigger, I had to go straight to the Emergency department at the hospital, and they would do an emergency procedure to cut in and drain the abscess. Now that’s stressful! Constantly having to gauge if it’s any worse and then being ready to run to the hospital if it is! The lump was on the front of my face, as well as on the roof of my mouth behind my teeth. And of course it got bigger. So one afternoon I went to Emergency, as requested, and they looked at me like I was an idiot and said there is absolutely nothing they could do. They touch nothing within the mouth, that’s a dentist’s job. Um… ok… I swear the dentist told me to come here. According to the nurse the dentist was lying and needed to get his facts straight. About 6 weeks or so after this ordeal started, I finally had my letter and booked my appointment at Guy’s Hospital. This was when I met the lovely Dr. Sproat, who whisked me away for scans and managed to get me in for a biopsy on the same day as my appointment. A week later I was back to see him, he was telling me the results and I was relieved and happy to have some idea finally about what was going on. If there were any confusion before, yes now, after the work of the first dentist, my tooth was dead. He killed it. I had it confirmed later that the tooth had not been dead beforehand, this was all unnecessary. So now I’ve got this sore, temporarily filled front tooth, which means I can’t bite into anything hard. I suppose you can’t expect an every day dentist to know how to spot a very rare cancer in a very rare location. I suppose he did everything he could, everything within his realm of expertise. You just wouldn’t expect them to do work if they’re not sure what the problem is. I don’t know if there’s anyone to blame. It’s just a series of unfortunate events, culminating in a cancer diagnosis. Some people end up in hospital when they find out they have cancer, organs failing, and operations done. Mine wasn’t too bad in the grand scheme of things. Just makes you wonder, with cancer being so prevalent, why is it not more in the forefront of people’s minds? But then again mine is rare. So who knows. How could they have known? I just wonder if the dentists had listened to me in the first place, maybe we could have avoided all of this? Oh well. It’s done now, and it’s not too bad really. No use crying over spilled milk. Or murdered teeth. Methotrexate is seriously a walk in the park compared to my lovely Cisplatin/Doxorubicin combo from the first week. I mean… I guess I should start from the beginning. So I come in on the Monday and I have to be here for pre appointments with literally everyone, checks, talks, find out about my drugs, etc. Then I have to start taking my first tablets. They’re a bit of a pain, not going to lie. I have to take them every 6 hours starting midnight that night. So lots of alarms throughout the day and night to make sure I don’t forget. I have those for 2 days and then they switch to other ones which take over the 6 hour slot, and I take them until they tell me to stop. I also have my thousands of anti nausea tablets (but less than last time). So on the chemo day (Tuesday) they set me up with a backpack of hydration at 8:30 am and send me off, and then I go back at 12. The chemo itself only goes for 4 hours. And I sit in the Ambulatory Care ward for that. And the chemo is bright yellow! Looks pretty cool (and yes, I wee that colour yellow for a couple of days after). I feel radioactive. Then I go back to the Cotton Rooms and pretty much spend as many days there as I need to until it gets out of my system. I need to go back every day for blood tests, and to refill my liquids. I also once again need to log all my liquids in and out. And on top of that this time, I have to use a dipstick to check the pH of liquids out. And monitor it. And as soon as it drops below a certain pH I have to take two sodium bicarbonate tablets. And if it goes below another pH I have to take 4. Then if it goes any lower I have to call them immediately and rush over and get a sodium bicarbonate transfusion. This is… mostly ok when it’s all in the happy range, but as it gets lower, it’s hard to tell which degree of colour it is. Is it in the dangerous range? No it’s kinda mottled 4-tablet colour and also got a bit of no-tablet colour. Do I take some anyway? And has it got the pinky hue of the transfusion-needed colour? Or is it ok and still sitting at a pH of 6 so take 4-tablets and hope that it goes up. GEEEEEEEE! JUST MAKE SURE IT DOESN’T DIP BELOW THE COLOUR THAT MEANS 6!!! Also it’s often one colour when you’re dipping it, but when you take it out it goes further to the dangerous end of the scale. Does that mean it’s more correct when it’s been in contact in air? Or when it’s still in? Then you yell to Charlie to ask him if he thinks your wee pH colour looks ok. All of this self-diagnosing stuff is tricky! But we’ll get there. How do I feel? Moments of nausea (but not as bad as last time). Absolutely exhausted and my brain is foggy. My sleep is pretty disrupted because even when I get to sleep I’m then awake again in a few hours needing to take more pills or go to the bathroom. Also taking steroids again doesn’t help me sleep. But. No pain in my PICC line, just a strange fluttery/rumbly feeling sometimes. So that is a relief! This one is a risk to your kidneys, which… you know… is bad. But not to your heart. So it’s a bit less scary. Also this time the chemo isn’t constant for the whole time, just the water. So that’s much nicer. They’ve booked me in until Monday, but have said I will probably be out by tomorrow (Friday). So it’s just a matter of waiting and seeing. I suppose as I progress through the cycles it might take my little kidneys longer to get it all out. But the results of my blood tests from yesterday were perfect. So if tomorrow’s are ok then it should be home time!! Then I’m home for the weekend, and back on Monday for Methotrexate again. And the following week it’s all back to Cisplatin/Doxorubicin (groan) and then two weeks of recovery. But most importantly, at the end of next week, I will have FINISHED ONE WHOLE CYCLE!!!!!!!!!!! And that’s something to shout about!